In my life and my art, some of my best moments are very messy. If I stopped after every session to clean it all back up, well, I’d be spending a lot of time cleaning. Yes, occasionally my studio or office gets a little chaotic for my tastes. When my productivity gets slowed down by piles of ideas, or clothes on top of my recording equipment (not for sound dampening) then I know it’s time to put things in piles elsewhere. Don’t let your compulsive cleanliness get in the way of your soaring inspirations. I know when I was a kid I was like this. When I would get a “project” going I’d have ideas and parts all over my room. And sure enough, my mom would come by at some point and say, “You need to pick all that up, you know.” Buzz kill. Even as a young person I knew she was controlling me and my messy madness. So compulsive cleaning and hyper-organization can be a distraction. You can avoid sitting in the chair and writing, if you feel you absolutely must make up your bed and pick up the books off the floor. BUT… Do you need to? Or are you avoiding the more difficult prospect of facing your creativity head on? We all have lots of reasons for NOT doing our art. Fear. Money. Time. Relationships. No relationship. Depression. And cleaning your room can be one of those that’s more of a hold over from your little person times, when your mom had more sway than she does now. 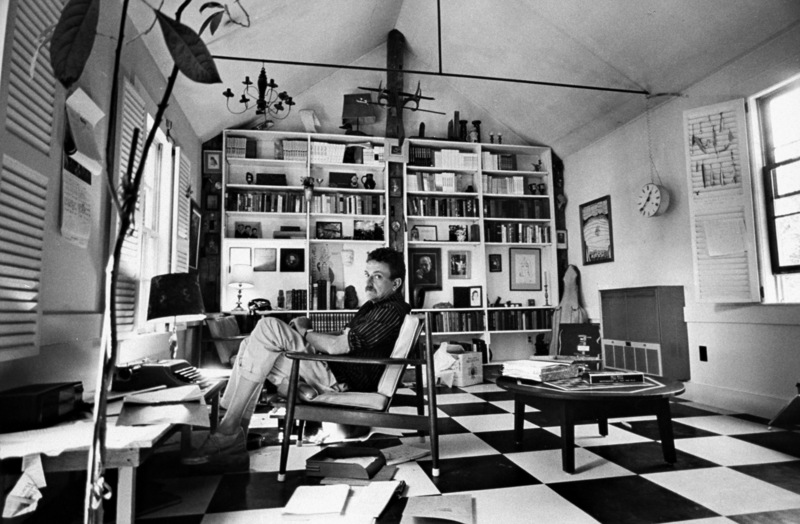 Here’s a shot of Kurt Vonnegut working in his home. The quote I often connect with Vonnegut, but today’s interwebs offered me no reference links, is this. Get over your childhood ideas about your messy room, or your messy habits. A messy studio is an active studio. A pristine desk or pristine painter’s studio is not in use. You want to put your creatitivy to use, if you’re always cleaning up, how do you pick up again on a project that wasn’t fully baked yet. You don’t. Let your mess show. Let your creativity bloom in any direction it needs to go. Don’t worry about mom. Send her to this post, when she complains at you. You deserve to get your creativity all over you, and all over your room. Do it. Clean up if you have to, or clean up as a celebration for the completion of some massive project you’ve been working and messing on. Let your mess be a pressure to keep you focused on completing. You can’t clean until you complete. Now Available in Print and eBook Format!